A slacker’s new appreciation of the virtues of trail maintenance. I have to admit I went grudgingly into this hike (the dutiful fiancé supporting her first trail maintenance hike out of a sense of loyalty to her better half [hey—I thought this was a hiking club!]). Thinking I was in for a long day of a slow-poking our way up the mountain (interspersed only with periods of acquiring splinters and inhaling paint fumes), I was pleasantly surprised when I arrived at Albemarle High School and saw that in addition to hike leader (and excellent guilt-trip-layer) Andy Willgruber, three other ladies had arrived for a day of trail work. And they seemed excited to boot! Hike regular CJ Woodburn and PATC members Séverine Fremy and Emerald Young were anticipating a day of perfect 70-degree spring weather, an opportunity to give back for the trails they enjoy, and a chance to also do a moderately paced 5-mile hike with excellent views of both valleys. When we arrived at the trailhead, the sharp breeze and cool weather had us adding a few more layers initially, but as we began the work of sanding, dusting, and painting the first post, we quickly warmed up and the work went surprisingly fast. Our tasks consisted of painting the new posts that mark the AT relocation (the original trail had become badly eroded in places), refreshing AT blazes that had faded, and trimming thorny bushes and branches that were encroaching on the paths. In addition to laughter and conversation, the “thank yous for what you do” from the occasional through hiker made the work not only enjoyable but a reminder of just what PATC really does. A few times I imagined how comforting that white blaze must be when in a particularly long and wooded stretch. And the posts, freshly painted, seemed to be subtle but encouraging sentries of civilization to fellow nature enthusiasts—welcoming hikers on to the next stage of their journey. As promised in the hike description, “many hands made light work,” and before we knew it, we were cresting the hill and looking at our last two posts—and a little disappointed that we didn’t have more to paint! After stopping to enjoy the view of both valleys (Shenandoah Valley to the west; Rockfish Valley to the east), we determined it was too early for lunch and continued on for the rest of our hike. We posted our final “wet paint” sign, stashed our painting supplies out of the way, and headed further along the trail, snipping and clearing a few prickly vines and low-hanging branches as we went. It wasn’t long before we spotted one of our first exciting wildflower finds of the day. Hidden below its unassuming umbrella foliage was a deep purple wild ginger flower—a buried gem among the decaying leaves. It wasn’t long before Showy Orchis, Jack-in-the-Pulpit, and May-apples were added to the list. Finally, we headed back down to Beagle Gap. Everyone agreed for various reasons that adding the extra two miles to Bear Den and back was really unnecessary. At the end, cold Bold Rock ciders were offered to the hard-working crew. Folks then headed back to C-ville with plenty of a beautiful spring day left for other pursuits. Wildflower Hike Apple Orchard Mt to Petites Gap, Saturday April 26, 2014. Nineteen folks joined hike leader Mike Seth on this perfect spring day including C.J. Woodburn, John Brandt, Andy Willgruber, Briana Taylor, Iva Gillet, Brian Muszynski, Sunny Choi, Dan Ralston, Jeanne Densmore, Jeanne’s mom and dad- Tom and Barb Miller, Dave Borszich, Clai Lange, Kelly O’Rourke, Susanna Williams, Marty Snell, and Dave and Nancy hiking with the group for the first time. This was supposed to be a joint hike between the Cville and Southern Shenandoah chapters but only Mike Smith who rode with Mike Seth came from the valley. We dropped some cars for at Petites Gap at MP 71 on the Blue Ridge Parkway and then started at the Apple Orchard parking lot at MP 78.4. About ten minutes into the hike we split into two groups. 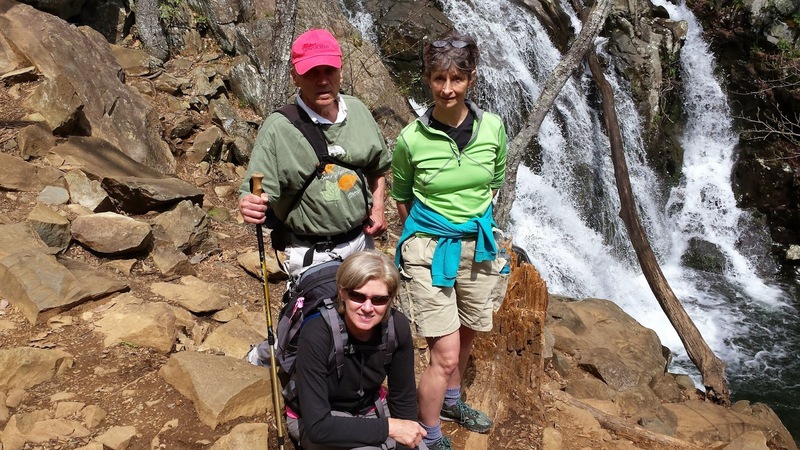 Dan Ralston led seven other hikers on the shorter 7.3 mile hike on the AT and eleven hikers opted to join Mike Seth for the longer version that included a 3 mile out and back to the falls with the plan to meet at the top of Apple Orchard for lunch. Unfortunately Liberty University was having 350 students running along the trail up from the falls so the long group decided for longer Cornelius Creek Trail. That way we would do a five mile loop rather than an out and back and although it added a couple miles no one seemed to mind. We took our time looking at whatever was blooming. The long hikers tried to contact Dan to suggest that the short hikers proceed without us but couldn’t get through. Jeanne and her father, and C.J. sacrificed the last descent to the falls to catch up with the short hikers while Kelly led the rest to the falls which were quite impressive after a heavy rain. The short hikers lingered for a while on Apple Orchard Mt, the highest point on the AT between Mount Rogers and New Hampshire, and proceeded to move on when Jeanne and C.J. arrived. Eventually the long hikers caught up with most of them. Iva, Andy and Briana, Dave and Nancy, Sunny and CJ scurried ahead while the rest made their way slowly along the trail; it was getting toward seven when we all finished. Eleven folks had supper at Don Tequilo’s in Buena Vista. Although billed as a wildflower hike due to the unusually late spring most of the wildflowers were only blooming at the lower elevations, especially around Petite Gap. We saw large numbers of Dutchman’s breeches, trillium grandiflorums, toadstool trilliums, several species of blue, yellow and white violets, fire-pinks, bluets, wood-bettony, bloodroot, early meadow-rue, rue anemones and coltsfoot. There were lots of gallax, lilies and May apples waiting to bloom. We could see the march of spring along the mountain sides lush and green trees and shrubs at the base giving way to a still leafless forest further up. What a beautiful day and what a magnificent hike! There was lots of water and very few crowds at the usually busy Dark Hollow Falls. 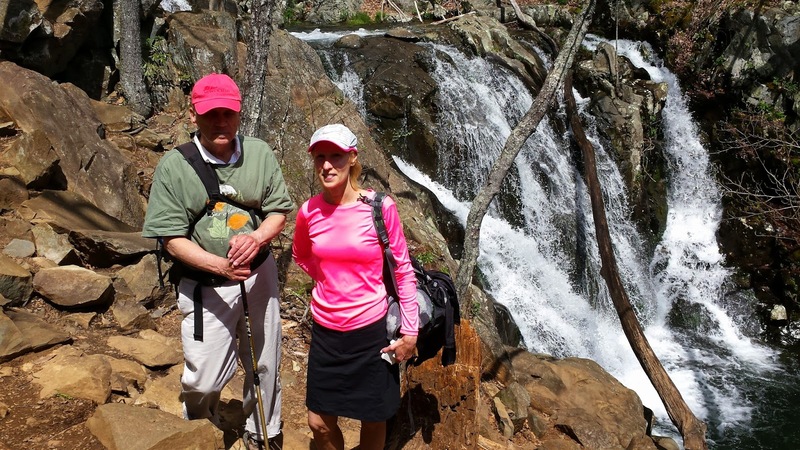 This was the first time Barbara Shenefield and Clai Lange have been to see Rose River and Dark Hollow falls. They were not scared though as they were expertly guided by both Kelly O’Rourke along with Leon Gorman. Clai administered some first aid to a hiker who twisted his ankle at the base of Rose River. Emergency workers were summoned to help him, as there was nothing further we could do. We enjoyed lunch at Rose River, walked up Dark Hollow falls to the visitor center, then back in the woods to the Amphitheater in the campground where we started. My GPS tracker said exactly 7 miles. We saw lots of flowers, and really had a great time. After all the rain, the falls were spectacular!